Eduniversal Best Masters Ranking ranked our Master of Science Program in International Hospitality and Tourism Management No. 47 in its selection of the top 100 Master in Tourism and Hospitality Management programs offered worldwide. This is one more proof that VUM offers modern higher business education and prepares competitive students who are ready for joining real international businesses; it is also a proof that the stimulating and secure learning environment of VUM together with the encouraging lecturers help students become leaders. The Eduniversal Best Masters Ranking is a true assessment of global masters and MBA programs designed to help prospective students determine the best choice for their graduate studies. Each year this ranking evaluates more than 12,000 postgraduate programs. The final ranking is determined through a global survey of 5,000 international recruiters, 800,000 students and over 10,000 representatives from 1,000 academic institutions in 154 countries. 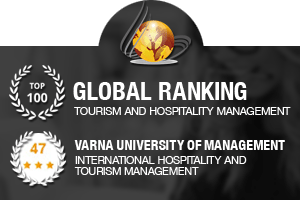 Varna University of Management (VUM) is famous for its international environment and well-prepared lecturers so it is consistently ranked among the best business schools in the world. The MSc in International Hospitality and Tourism Management in VUM gives students a visa free passport to any hospitality business in every part of the world. International Hospitality and Tourism Management (IHTM) students study a synchronized curriculum with Cardiff Metropolitan University and meet the same high standards in examinations.